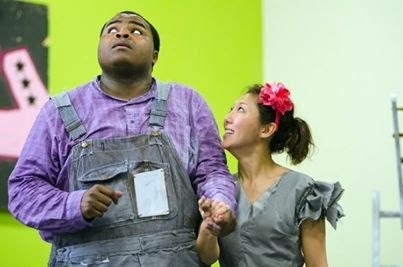 What Ten Thousand Things does better than any other theater company I know is harness the power of collective imagination to transport the audience to another world. Because they often perform in prison cafeterias and community centers, they cannot rely on the usual theatrical tricks of lighting, costumes, and set. The audience can clearly see what's going on and that this is make-believe, which somehow makes it even more magical when we willingly forget our surroundings and go on this journey with the cast, who are always so fully committed to and immersed in the story they're telling. 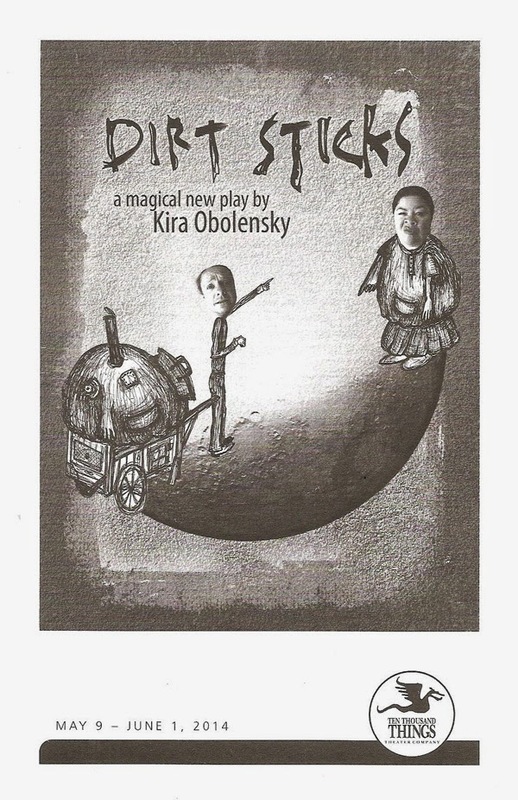 In the case of Dirt Sticks, a new play written by playwright in residence Kira Obolensky, the experienced theater audience is in the same boat as TTT's inexperienced theater audiences - we're all approaching the show with no prior knowledge of the piece. It's a rare and wonderful thing to go to the theater with no idea of what to expect, and to be thoroughly entertained and completely transported to another world. Dirt Sticks tells the story of a young man named Henry Wand, an orphan raised by his aunt, whom he calls Mother Spindle because she's tightly wound. He and Laurel, another stray that Mother Spindle has taken in, work in a ladder factory. They live a pretty uneventful life, until a peddler comes to town with the full moon. Along with the usual goods, he sells visions of the future and the past. Through this, the story of Henry's birth is told as his mother's ghost visits her sister and son. Henry's life is changed forever as he learns the truth of his history. It's a simple story really, but feels like an ancient fairy tale as it unfolds in front of us, occurring somewhere outside of time and space. This five-person cast is just delightful and very interactive with the audience (if you're sitting in the front row, be prepared to be asked to buy a penny for a nickel). Stephen Cartmell is absolutely mesmerizing as the mysterious peddler, spinning tales as peddles his wares. Kimberly Richardson is her usual nimble clownish self, particularly when Laurel buys the magical dancing shoes that never rest. Sun Mee Chomet is lovely as Henry's ghost mother, full of life, happy to be alive again, and trying to entice Henry to join her. Thomasina Petra is the stern Mother Spindle, eventually revealing a softer side with a long ago hurt. And last but not least, H. Adam Harris is charming as our hero Henry Wand, so curious about life and his past, eager to move forward. Helping to create this magical world are the extremely sparse set pieces by Irve Dell, including a whimsical flying pigeon (manned by Stephen Cartmell), a lopsided ladder, and a large bowl in which Mother Spindle cooks soup and her healing elixir. Peter Vitale again creates the sound world of the story, which almost makes you want to close your eyes and just listen. These elements and this cast under the able direction of Artistic Director Michelle Hensley create a very specific world that is a pleasure to live in for a few short hours. Dirt Sticks continues through June 1 in an upstairs room at Open Book. These shows have a tendency to sell out so get your tickets now. I've said it many times before and I'll say it again - if you're a Twin Cities theater fan and you've never seen a Ten Thousand Things show, you're missing a huge part of what makes this community so special. 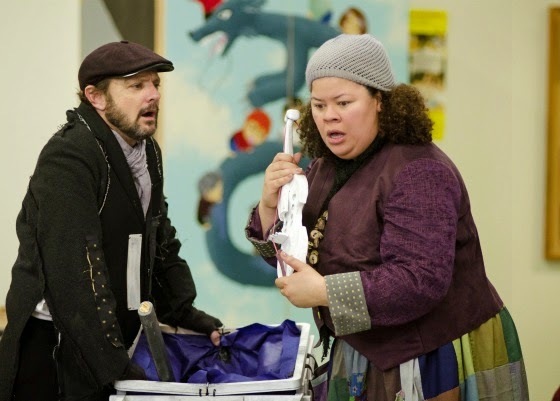 Check out Dirt Sticks, and then come back next season for Romeo and Juliet, The Unsinkable Molly Brown, and another new Kira Obolensky play, The New Don Juan.